The Ohio State men’s hockey team’s eight-game unbeaten run and, more importantly, season ended against the No. 1 seed Minnesota Golden Gophers on Friday. With the defeat, the Buckeyes bow out of the Big Ten Tournament in the semifinals. The final score between the two sides at the Xcel Energy Center in St. Paul, Minnesota, was 4-2. The Buckeyes did not get off to an ideal start when freshman forward Dakota Joshua received a five-minute major penalty and game misconduct for checking from behind. However, the Buckeyes were able to kill it off and grab the lead later in the period courtesy of sophomore forward Kevin Miller. A shot from sophomore defenseman Janik Moser was deflected into the path of freshman forward Miguel Fidler, whose shot was also blocked but fell right into the path of Miller. The second period came and went without any goals. That would not be the case in the third and final period. The Golden Gophers equalized early in the third period with a goal from freshman forward Tyler Sheehy. 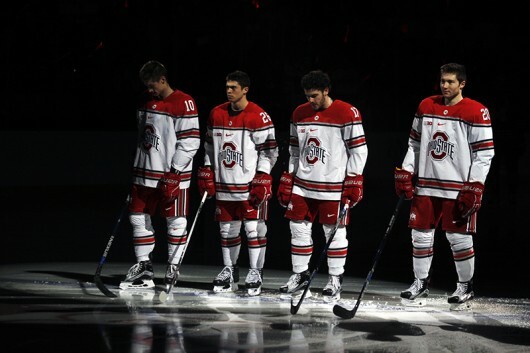 Senior defenseman and co-captain Craig Dalrymple was controlling the puck in the neutral zone for the Buckeyes, but it was dispossessed by Sheehy, who then fired past OSU junior goaltender Christian Frey. Minnesota grabbed the lead less than four minutes later. Sophomore forward Leon Bristedt centered a pass from the left side for junior forward Vinni Lettieri, who promptly slotted it home to make it 2-1. Things continued to get worse the Buckeyes. A defensive mix up allowed Sheehy to lay off the puck for junior forward Taylor Cammarata, who put it in the back of Frey’s net. Just a little over five minutes later, Sheehy would release Cammarata once again and give the Golden Gophers a nearly insurmountable 4-1 lead. OSU junior forward David Gust managed to cut the Minnesota lead to two with just over two minutes left in the period. However, it was not enough. With the win, the Golden Gophers advance to the final of the Big Ten tournament on Saturday against Michigan, while the Buckeyes head home for the summer.